Naganeupseong, Town Fortress and Village is part of the Tentative list of Republic of Korea in order to qualify for inclusion in the World Heritage List. Visited just recently (November 2016), no doubt - one of Korea wonders, folk village that is completely different from other Korean villages. The best town to start a trip is located in Southern Korean province of Jeollanam-do, Suncheon. From there - bus stop near intercity bus terminal - there are 4 different buses (16, 61, 63, 68) daily to Naganeupseong Fortress Town. They are not very frequent but the first should be around 8.00 a.m. (next one should be around 10.00 a.m.) The whole trip from Suncheon downtown should not take more than 40-45 minutes. Uniqueness of Nagan Fortress Town (as it is called for short) lies in its layout. The whole village is surrounded by completely preserved walls with gates, moats and watching towers. While walls are a little bit of Joseon style (similar to those in Namhansanseong or Hwaseong), the majority of village buildings is covered with straw (tchatched roofs). What's more it is a normal village with residents trying to live normally despite huge number of tourists. It is easy to combine visit to Naganeupseong with Seonamsa Temple located 18 km away. In fact there is a direct bus (16) that goes from central Suncheon to Naganeupseong then to Seonamsa and returns to Suncheon. Naganeup village has two defining characteristics. It is not a village of the aristocracy, but one of the common people, with thatched roofs and simple stone walls. The second important detail is the village is protected by a fortress that encloses the village built to protect the inhabitants from Japanese soldiers or pirates. People still live in the village, and some of the homes have been almost completely redone or refurbished, but numerous preserved homes remain. As well as some of the town government buildings. 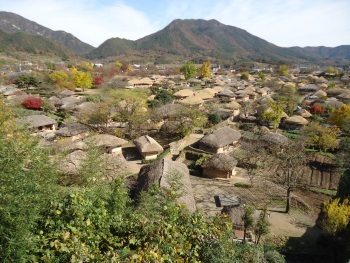 There is a pretty good chance this village will be inscribed (eventually) because it is the only one if its kind left in Korea. 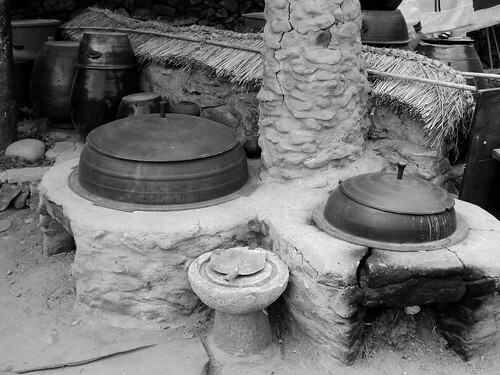 A century ago there were dozens of such villages, but now there is only Naganeupseong. Strolling around the small alleyways within the village is a highlight, and to get a better sense of the layout of the town, walk around the relatively small fortress wall. If you enjoyed visiting Hahoe or Yangdong, you would also enjoy a visit to Naganeupseong, while appreciating the subtle differences. Not being centered around an aristocratic clan makes this historic site very different from most well-preserved hanok villages in Korea. 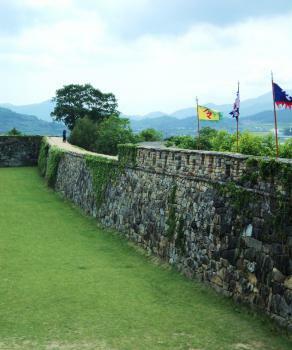 Its defensive fortifications are also a necessary precaution to its location in Jeollanam-do. Naganeupseong is actually closer to Fukuoka Island in Japan than Seoul.